The peace enforcement mission in Bosnia and Herzegovina has presented a unique challenge to the civilian and military organizations assembled there to implement the General Framework Agreement for Peace (GFAP) for Bosnia and Herzegovina agreed to at Dayton in November 1995. The formidable task facing the Office of the High Representative, the NATO-led Stabilization Forces, and other International Community (IC) agencies is how to change ingrained hyper-nationalistic attitudes within Bosnia, if they can be changed at all. Changing these attitudes, to a large degree, is dependent upon transforming existing media venues and developing new ones in Bosnia that are more open, objective, and provide a forum to ease tensions through discourse rather than act as a drumbeat for violence. The primary focus of the effort to establish free and open media in Bosnia has been the struggle with Srpska Radio-Television (SRT)  the official media organ for the Bosnian-Serbs in the Republika Srpska (RS). 1 The conflict between SRT and the IC in Bosnia, especially during the summer and autumn of 1997, and what lessons can be learned for future peace operations, is the central feature of this examination. The war in Bosnia was as much a media war as a ground war. Mark Thompsons seminal work, Forging War, convincingly demonstrates the central role played by the media in former Yugoslavia, particularly television, in unleashing latent ethnic hatred. 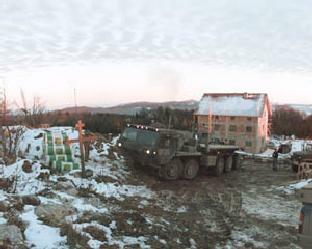 2 When the NATO-led Implementation Forces (IFOR) 3 entered Bosnia in December 1995, along with the civilian organization charged with implementing the GFAP in Bosnia and Herzegovina -- the Office of the High Representative (OHR), some charged they were unprepared for the sophisticated regional media environment, or ready to confront and change the local media venues. 4 It is debatable whether this perception of the early part of the peace operation is correct. Still it is clear a willingness to challenge and transform the Bosnian media increased dramatically when the leadership of the IC in Bosnia changed in the summer of 1997. The military leadership within IFOR was dominated by Americans, who, in turn, were influenced to a large degree by Bosnia Cassandras in the Pentagon who believed intervention in Bosnia was fraught with danger and not in the vital strategic interests of the US. Therefore, IFOR, and then SFOR, interpreted its mission as solely one of implementation of the military aspects of the GFAP and avoided assistance to civilian agencies as much as possible.5 The nomination of American General Wesley Clark to the NATO position of Supreme Allied Commander on 11 July 1997 was a signal to the people in Bosnia that the self-imposed limitations SFOR had placed upon itself would soon change. 6 Clark, US Ambassador Richard Holbrookes military assistant during the Dayton negotiations, was well versed with what had been the expansive intended role of the military in the implementation of the GFAP. The Antenna War was triggered by the attempt of former Radovan Karadzic supporter, Republika Srpska (RS) President Biljana Plavsic, to build an alternate RS powerbase in the northern Bosnian city of Banja Luka. 8 Plavsic turned against her former mentor Karadzic when it became clear to her that the level of corruption emanating from Karadzic and his cronies was strangling the RS economy. On 28 June 1997 she ordered RS Interior Minister Dragan Kijac, a strong Karadzic supporter, suspended from office, and on 3 July, ordered the dissolution of the RS National Assembly. Despite Plavsics orders, and with the tacit endorsement of Karadzic, the RS Assembly met anyway on 4 July near Karadzics headquarters in Pale to debate Plavsics actions. A constitutional crisis was at hand in the RS, and the RS Supreme Court ordered a suspension of all enactments of law by any RS government organ. A full-blown power struggle between Plavsic and her supporters in Banja Luka, and Karadzic and his supporters in Pale, was underway. During this delicate political infighting in the RS, SFOR attempted the capture of two indicted Bosnian-Serb war criminals near Prijedor, about 30 miles west of Banja Luka, on 10 July 1997.9 Some in the press have also asserted that during July and August SFOR attempted to capture Radovan Karadzic. 10 Also during this time, Karadzics forces arrayed themselves to disrupt Plavsics power base in Banja Luka. Deciding to overtly support Plavsic, SFOR troops interceded near Banja Luka on 11 August when pro-Karadzic Special Police attempted to intimidate Plavsic supporters. Having failed to win the contest in the streets, the Pale Serbs turned to a weapon that had never failed them in the past  television. On 21 August, SRT juxtaposed images of SFOR soldiers with the Nazi SS and, cleverly playing upon the similarity in the two abbreviations, referred to the force in Bosnia as "SS-FOR." 11 With the encouragement of the IC, the SRT studio in Banja Luka then shut off broadcast feeds from SRT in Pale on 25 August and began broadcasting its own news that was pro-Plavsic and anti-Karadzic from a transmitter on Mount Kozara. Pro-Karadzic Serbs, fully cognizant of the power of regional media, knew that a battle for the airwaves, and ultimately the minds and hearts of the Serbs of Bosnia, was underway. On 27 and 28 August conflicts occurred between SFOR soldiers and pro-Karadzic Serb police near the SRT Duge Njive transmitter outside of Doboj when it was thought SFOR was about to shut the transmitter down. Also on the 28th, riots occurred in Brcko after incitement broadcasts by local pro-Pale SRT radio. SRT radio exhorted all Serbs in Brcko to assemble and prevent SFOR from inspecting a police station in the city. Radio broadcasts called for "
Another disturbance occurred at the Udrigovo transmitter outside of Bijeljina on 1 September. Over 250 pro-Karadzic Serbs assembled to protest SFOR presence around the transmitter. SFOR claimed their forces were there, not to control the tower and its transmissions, but to prevent violence between Plavsic and Karadzic supporters. To lessen tensions, OHR Deputy Jacques Klein fashioned the so-called "Udrigovo Agreement" on 2 September 1997. This agreement was aimed at stopping SRT-Pale from further inflammatory reporting against SFOR or any other International Organization in Bosnia. As part of the agreement, SRT supplied program time to OHR. 13 SFOR television assets were seconded to OHR to fill a daily one-hour slot on SRT Pale. Unlike in the past when further inflammatory reporting by SRT-Pale might have been met with more attempts at mediation and possible threats of economic action, the new leadership at NATO and OHR was ready to quickly and decisively respond. The Sintra Agreement of May 1997 gave OHR the power to take action against indigenous media venues in Bosnia, like the pro-Karadzic SRT that attempted to subvert the GFAP. 14 To put teeth into the Sintra Agreement, OHR created the Media Support Advisory Group with the mission of monitoring, vetting, and, if necessary, re-structuring of the Bosnian media. Despite all of the tension, municipal elections in Bosnia and Herzegovina did occur generally peacefully on 13 -14 September. However, it seems clear OHR and SFOR were merely waiting for the pre-text to take aggressive action against SRT-Pale. The justification occurred when, on 28 September, remarks by International Criminal Tribunal Prosecutor Louise Arbour were edited by SRT in a way to denigrate the efforts of Arbour and her organization at The Hague. 15 This was deemed to be in violation of both the Sintra and Udrigovo Agreements, and OHR asked SFOR on 1 October to seize four SRT transmitters (Udrigovo, Duge Njive, Trebevic, Leotar) and effectively shut down SRT Pale. SFOR did indeed take possession of the four transmitters, and SRT Pale was forbidden to make any further transmissions. Meanwhile, the pro-Plavsic SRT Banja Luka began to systematically take over this communications backbone. Attempts by SRT Pale to get back on the air were short-lived. Desperation on the part of the pro-Karadzic forces was apparent when equipment at a key transmitter link at Veliki Zep, near Han Pijesak, was sabotaged and a transmission tower near Bijeljina destroyed. This action by the Karadzic supporters effectively shutdown pro-Plavsic broadcasts to about 1/3 of all Bosnian-Serbs. However, by the end of October, OHR was able to relay the SRT television signal from Banja Luka by satellite to the rest of the RS. By the spring of 1998, the terrestrial transmission backbone was repaired. SRT Banja Luka was receivable by common, over-the-air antenna in all of the RS. 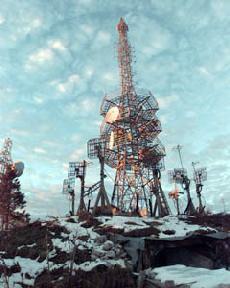 Soon, all the transmitters were placed in the control of SRT Banja Luka, and SFOR soldiers withdrawn from the sites. The slant of SRT reports is now favorable towards the IC in Bosnia and no longer providing a call for violence against SFOR or other IC representatives. An international supervisor, appointed by OHR, oversees the operations of SRT. The policing of RS media is now often handled internally by RS officials. Dodik dismissed the editors of 16 RS radio and television stations in July 1998 for biased practices. How should these events in Bosnia affect other peace operations? Separating forces, providing humanitarian relief, developing economic infrastructure, and instituting confidence-building measures all have a place in peace operations and are certainly "bread and butter" tasks. However, a peace operation is ultimately successful, and the IC can only disengage with a clear conscience, if the attitudes and behaviors of the people in the region are changed. While in Bosnia, Croat, Muslim, and Serb may not live together again for many generations, it is perhaps possible for them to live side-by-side without violence, if for nothing other than pragmatic economic reasons. The recognition on the part of OHR and SFOR that the media needed to change in Bosnia if peace was to have a chance acknowledges that the sooner ingrained hyper-nationalistic attitudes in Bosnia start to change, the sooner the IC will achieve "end state" and safely scale down its commitment without fear of a new conflict starting. The amount of money needed to monitor, shape, and develop responsible media is small indeed when compared to the total expenditure of funds typically spent on peace operations. Yet, the possible return on the investment is tremendous. The impact of shaping local media should be studied more completely and the capability made available to those overseeing peace operations. 1 Bosnia-Herzegovina is made up of two semi-autonomous "Entities"  "Republika Srpska" and the Muslim-Croat "Federation." 2 Mark Thompson, Forging War: The Media in Serbia, Croatia, and Bosnia-Hercegovina (Avon: The Bath Press, 1994). 3 IFOR (Implementation Forces, term used until 20 December 1996), SFOR (Stabilization Forces, term used since 20 December 1996). 4 This opinion expressed by Pascale Combelles Siegel, Target Bosnia: Integrating Information Activities in Peace Operations. NATO-Led Operations in Bosnia-Herzegovina, December 1995-1997 (Washington, D.C.: National Defense University, 1998), p. 77. 5 The reluctance of the US military to become involved in Bosnia and the desire to have a very circumscribed mission is well recounted by Wayne Bert, The Reluctant Superpower: United States' Policy in Bosnia, 1991-95 (New York: St. Martin's Press, 1997), in Warren Zimmermann, Origins of a Catastrophe: Yugoslavia and Its Destroyers, America's Last Ambassador Tells What Happened and Why (New York: Times Books, 1996), pp. 214-5, and David Callahan, Unwinnable War: American Power and Ethnic Conflict (New York: Hill and Wang, 1997), pp. 191-7. Annex 1-A details the military implementation of the General Framework Agreement for Peace. There are 11 annexes altogether. GFAP available at: http://www.ohr.int/gfa/gfa-home.htm . 6 Dayton negotiator Richard Holbrooke makes it clear that it was never intended for IFOR/SFOR to be as passive as their self-imposed constraints made them. Richard Holbrooke, To End a War (New York: Random House, Inc., 1998). 7 Articles about Westendorp: "Our Man in Sarajevo," El Pais (March 29, 1998) and Chris Hedges, "Diplomat Rules Bosnia with a Strong Hand," in The New York Times (April 10, 1998). Klein profile: Jane Ciabattari, "Our Man in Sarajevo," in Parade Magazine (August 17, 1997), p. 10. Kleins combative attitude reflected in his press conference in Brcko on September 2, 1997 http:www.ohr.int/press/i971121a.htm and in an interview with Nedjeljna Dalmacija on November 21, 1997 http://www.ohr.int/press/i971121a.htm . 8 Karadzic has been indicted for war crimes by the International Criminal Tribunal at The Hague and was formerly the President of Republika Srpska. For a profile on Biljana Plavsic profile, see: Elizabeth Rubin, "The Enemy of Our Enemy," in The New York Times Magazine (September 14, 1997), pp. 58-61. 9 Simo Drljaca was killed during the attempted capture and Milan Kovacevic was captured and sent to The Hague, Netherlands, to stand trial before the International Criminal Tribunal. Kovacevic pled not guilty to the charges against him and died in his prison cell on 1 August 1998. For a firsthand account of Kovacevic and Drljaca while they were the masters of Prejidor, see: Peter Maass, Love Thy Neighbor: A Story of War (New York: Vintage Books, 1996), pp. 36-49. 10 See Richard J. Newman, "Hunting War Criminals: The First Account of Secret U.S. Missions in Bosnia," in U.S. News and World Report (July 6, 1998), pp. 45-8. 11 "Anti-NATO Images on Bosnian Serb TV," in The New York Times (August 23, 1997), p. A6. SFOR Press Conference, August 22, 1997, at: www.nato.int/ifor/landcent/t970822a.htm. 12 "Media Putch [sic]" in Monitoring Report (vol. 3, no. 5, September 7, 1997). This periodical published by Media Plan and the Institute for War & Peace Reporting. 13 Text of the Udrigovo Agreement at: http://www.ohr.int/press/p970902a.htm . 14 Text of the Sintra Communiqué, in particular paragraphs 66-70, at: <http://www.ohr.int/docu/d970530a.htm>. 15 See: SFOR Press Conferences, September 30, 1997 and October 1, 1997, at: http://www.nato.int/ifor/landcent/t970930a.htm and http://www.nato.int/ifor/landcent/t971001a.htm . On the same day as the SRT inflammatory reporting about the visit of Louise Arbour, the offices of an independent Bosnian-Serb newspaper, Alternativa, in the pro-Karadzic stronghold of Doboj, were firebombed. 16 Photos from US 1ST Armored Division website: http://www.tfeagle.1ad.army.mil/photos/Photos.HTM . 17 Text of the Bonn Agreement available at: http://www.ohr.int.docu/d971210a.htm . 18 For a estimate of the positive influence of Dodik see: "The Tide Turns? ", in The Economist (January 28, 1998), p. 51. 19 Vote counts for the 12-13 September 1998 election show Poplasen received 324,000 votes to Plavsics 287,000. Radisic garnered 360,286 votes to Krajisniks 315,480. Despite the setback to the IC in the recent election, it must be remembered that in 1996 the IC was merely hoping a viable opposition to Karadzics Serb Democratic Party (SDS) could somehow be formed  much less have non-SDS candidates triumph in an election. 20 See text of the agreement between OHR and RTV BiH at: http://www.ohr.int/mediares/d980610a.htm . 21 See: Radio Free Europe, "Subversive Media," in Bosnia Report 13 (1 April 1998) at: http://www.rferl.org/bosnia-report/index.html ). Also: Emir Suljagic, "Interview with Senior Deputy, High Representative Hanns Schumacher: We Will Break the Hardliners of the HDZ!" in Dani (April 11, 1998) at: http://www.ohr.int/press/i980411a.htm . Also see transcript of SFOR/OHR/OSCE press brief on 28 August 1998 at: http://www.nato.int/ifor/landcent/1998/t980828a.htm . 22 Jamie F. Metzl, "Information Intervention: When Switching Channels Isnt Enough," in Foreign Affairs 76 (November/December 1997), pp. 15-20. See Richard Holbrookes response to Metzl: "Mehphistophelean Media," in Foreign Affairs 77 (January/February 1998), p. 158. 23 In Bosnia, OHR has established an Independent Media Commission with broad powers to monitor and regulate the regional media. The OSCE in Bosnia formed its Media Experts Commission to also oversee the media during the election period and to recommend punishments for candidates who violated the prescribed rules of media use. 24 Some see this possibility in Bosnia. See: "The Protectorate," in The Economist (February 14, 1998), pp. 50-1. 25 The issue of whether to encourage the development of many media outlets with little control in an emerging democracy or to rigidly control and monitor the existing outlets is well covered by Jack Snyder and Karen Ballentine, "Nationalism and the Marketplace of Ideas," in International Security 21 (Fall 1996): 5-40.